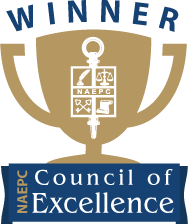 The Estate Planning Council of Central New York (ECPCNY) has been recognized as a Council of Excellence by the National Association of Estate Planners & Councils (NAEPC) as a part of the Leonard H. Neiman and Walter Lee Davis, Jr. Council of Excellence Award program. Also, EPCCNY member S. Mark Alton has been elected National President for 2019. Register Now! EPC-CNY Annual Meeting on May 6th at the Tailwater Lodge! The Estate Planning Council of Central New York, Inc. announced that it recently elected David W. Treichler, owner and investment executive at Arabella Wealth Advisors in Syracuse, as its new president. Treichler was sworn into office at the Estate Planning Council’s annual meeting at the Genesee Grande Hotel in Syracuse, along with the council’s new board members. The Estate Planning Council’s board directors are: Alyssa M. Barreiro, Wilmington Trust; Virginia F. Calvert, Melvin & Calvert Law Firm, PC; Lee M. Gatta, Prudential Financial; Sandra L. Kalbach, Solvay Bank; Richard C. Murphy, Richard C. Murphy Insurance & Financial Planning Concepts; Tammy L. Reyes, Firley, Moran, Freer & Eassa, CPA, P.C. ; Theodore J. Sarenski, Blue Ocean Strategic Capital, LLC; Kevin R. Sullivan, Rockbridge Investment Management; Susan D. Viel, D’Arcangelo & Co., LLP. Thank you to all that have participated in our EPC Member Survey. If you have not yet had a chance to complete the survey, we would like to hear from you. Please complete the survey by visiting https://www.surveymonkey.com/r/W8YLDDQ . Your opinion is valued and is vital in making changes that will benefit our members.